I can’t help but wonder if novelty beers are going too far. Or maybe not far enough? So what is a novelty beer? If you are new to beer geekery then you might think these are few and far between but that would be entirely incorrect. These days it seems that novelty beers are outnumbering the regular line-ups from some breweries. 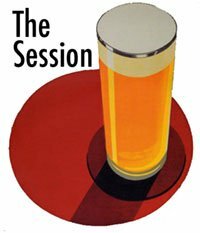 In fact if I was to write about all the weird novelty beers I have had over the years, I would provably be still typing come the November session. I could talk about many Brewdog beers but they have been done to death. I could talk about a number of US breweries with pumpkin this and blueberry that, again it's been done to death. Instead, I'm going to pick a beer that, well lets face it, has also been done to death but perhaps not so much be being named a novelty beer. I'm going to talk about a beer that has been for years considered the best beer in the world (not Carlsberg, that's only probably the best). A beer that is usually the number 1 beer on ratebeer, is currently number 2 on beeradvocate and just has so much bolloxology around it that this mythical beer, this ambrosia that only the worthy may consume, this trappist beer that people will gladly sacrifice their virgin daughters in the hope of getting a taste..... that when do finally get a taste you will often be very surprised by the result. Some people feel they have accomplished something. For a beer ticker it might be the ultimate tick. Others might think it was all worthwhile. Others might say to themselves "meh, don't know what all the fuss was about". And then of course there are those that might make a weird face and go back to drinking probably Carlsberg. The beer of course is none other than Westvleteren 12 brewed by the Saint Sixtus monks in Belgium. Wait hang on, have we got this straight... the beer with a marketing campaign that the big boys could only dream* of coming up with are monks? Well it should not be surprising really, after all the Catholic church has had 2000 years of marketing experience and no brewery can compete with that level of dedication. Now under normal circumstances, the real reason that Westvleteren 12 is so hard to get is that the monks restrict access to it. For instance, the only official way to get some is as follows, taken directly from the brewery website. And that's assuming you live in Belgium, or a surrounding country within reasonable driving distance. I went on a search in Belgium for it but was confounded at every turn. Even when I finally found a liqueur store that had it, they would not sell it. It was free if I spent €100 or so in the shop. Since I had to fly home and I had no luggage allowance, there was no way for me to get that much beer home. Now I am sure that people are looking at the image above and thinking that it looks a lot like a gift pack designed for sale in shops. This is where it gets interesting because that's exactly what it is. A novelty gift pack containing 6 bottles of Westvleteren 12 and two chalice style branded glasses. Normally there is no branding on Westvleteren 12. The only thing that distinguishes it is the cap which says what the beer is and has a different colour depending on the beer. Green for the blonde, blue for Westvleteren 8 and yellow for Westvleteren 12. The bottle itself has no branding and is the same used by many trappist breweries. Unless you are very new to the beer world, or were working in a remote location for the last year, you will probably know about these Westvleteren 12 bricks. The monks needed a new roof so rather than just ask for donations, they simply made up these novelty gift boxes and sold them for a reasonable profit. In Ireland, they would set you back €50 which is a reasonable enough price. It makes each bottle €8.30 or 6.33 if we assume each glass is worth €1. Buying directly from the brewery is cheaper of course, a lot cheaper but only if you live a reasonable driving distance, otherwise fuel and other costs will add up quickly. For many, this was possibly the only way to try the beer. Or perhaps try it again after enjoying it after tracking it down once. Feeling charitable, I bought two and my plan was to let them age and see how things progress. I opened my first one on the 25th of September 2012. I have actually had the beer before. I tried it alongside St Barnardus 12 with a result you can probably guess but how does this beer compare to the one I had before? I don't know how old that one was but it was certainly a lot better than the new one. In fact if I was a conspiracy theorist, I would say that it's a different beer. In fact it struck me more like St Barnardus 12 than Westvleteren 12. I might have to do another side by side. Could it possibly be that they contracted the beer to to St Barnardus again? Just for the bricks. There is no mention of that and it's probably not the case. Here is what I thought of the beer when drinking the latest incarnation. It pours a deep ruby red with a an effervescent off white foamy head. On taking a sniff I got slight dark fruit, lemon sherbet and some grape. A little disappointing actually. Then on tasting it came off as boozy sherry like. It's very fizzy but also has a creamy mouthfeel. Dark fruit and chocolate in the middle with a boozy finish. That's hardly the most complex description of a beer. It was consumed at room temperature, what was between 16c and 18c. I remember it being a lot more complex and less fizzy the last time so I wonder is it just that these bottles are too young? Has anyone else opened their bricks and tried the beer? Anyway that's the novelty beer I have picked for today. Happy beer blogging Friday everyone and thanks to Tiffany for hosting the topic. * And dream is all they would ever do because there is no money to be made in doing so. I think the US had two distributors, and I heard that both got the same allocation as the Irish distributor. In Jan.2011 I was able to buy W12 in De BierTempel in Brussels and Cambrinus in Bruges, 10euro/bottle. "Our beer shop is closed on Fridays, Sundays and national holidays as well as January 1-14 and the week following the third Sunday of September." Thanks for the info Unknown. TBN, that's a bit mad. Is that each distributor got the same as Ireland, meaning the US got twice as much as us? Even still, that's still no where near enough. There are still places here where they can be bought too, albeit they are very rare. I'd say there are still a few bricks knocking around in off licence store rooms. I liked it, and I didn't feel too hard done by after paying €50 for a six pack - as a beer geek, I knew I'd eventually regret passing it up - but I definitely have to try it side by side with the Rochefort 10 and St Bernardus Abt 12. I'm partial to both, and I reckon either of those could easily be the better beer.